Includes shipping for U.S. orders. 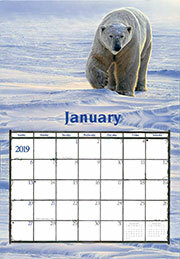 13 Month Fine-Art Wildlife Calendar! This is a large format Calendar (13" X 21") with the date sections organized to offer ample space for personal notations. Calendars include the moon phases, seasons, many traditional holidays and other notable days.. The tremendous response to our calendars clearly show that they are not “just calendars” but works of art. Our objective remains the same after 40 years, simply creating the most beautiful wildlife calendars possible. As you explore the following pages, we hope you are impressed by the talent and inspiration behind our calendars. Let us help you make your home and office become places of tranquility and refuge from the daily rigors of life.